Wise words. This is how two-lentil dal materialized in my kitchen. 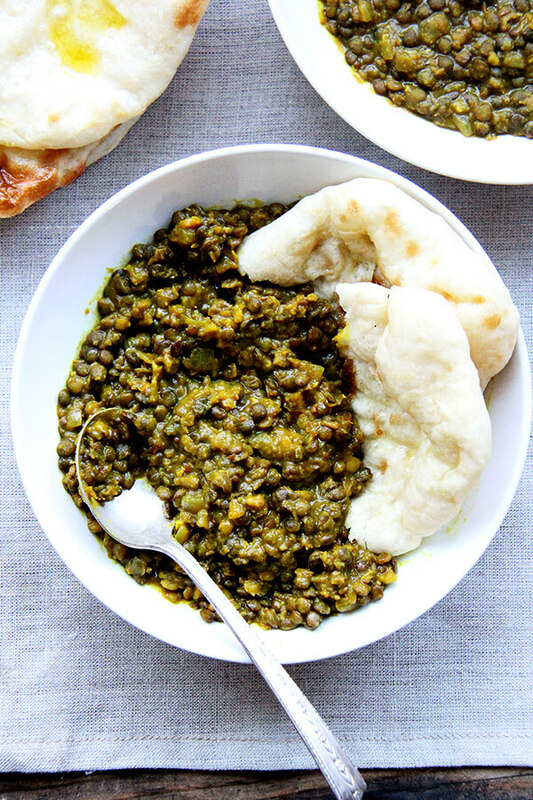 One night I scrounged two cups of assorted lentils from several near-empty, many-months-old bags, threw them in a pot and crossed my fingers. But the result, a happy mix of creamy and chunky, like a partially puréed soup, was very welcomed at the table, even more so than subsequent purebred dal attempts. Now, I realize, the texture I am describing may push this dish out of the category of dal altogether, but it’s delicious nonetheless and couldn’t be simpler to throw together: sweat an onion, add spices (cumin, coriander fennel, turmeric and crushed red pepper flakes) and lentils, cover with water, simmer until done. 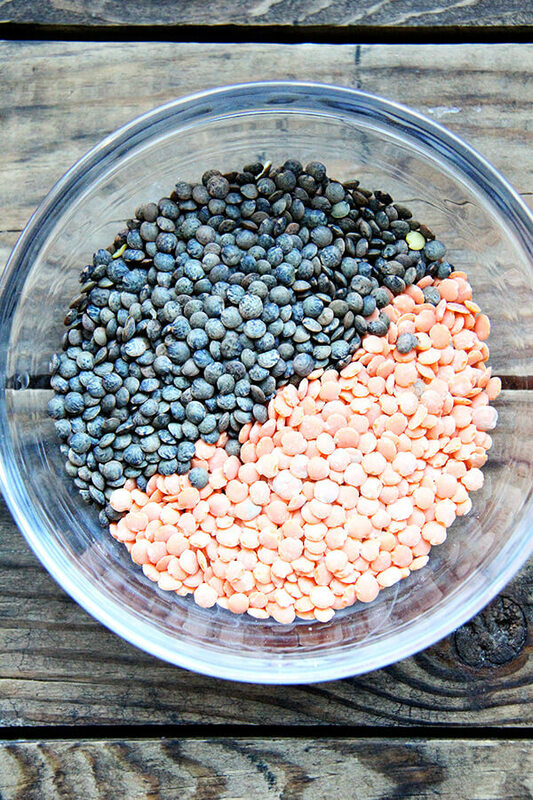 As I noted above, I like to use a mix of lentils such as petite French green lentils, which hold their shape, along with red, brown or yellow lentils, which quickly dissolve to mush, but experiment with what you have on hand and tailor to your liking. 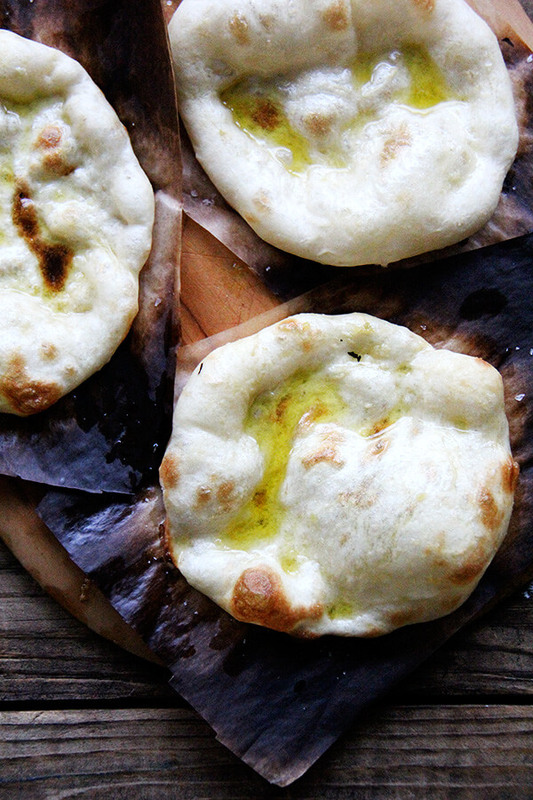 This is another great cooking-from-the-pantry recipe, which I welcome you to complicate by making your own flatbread. 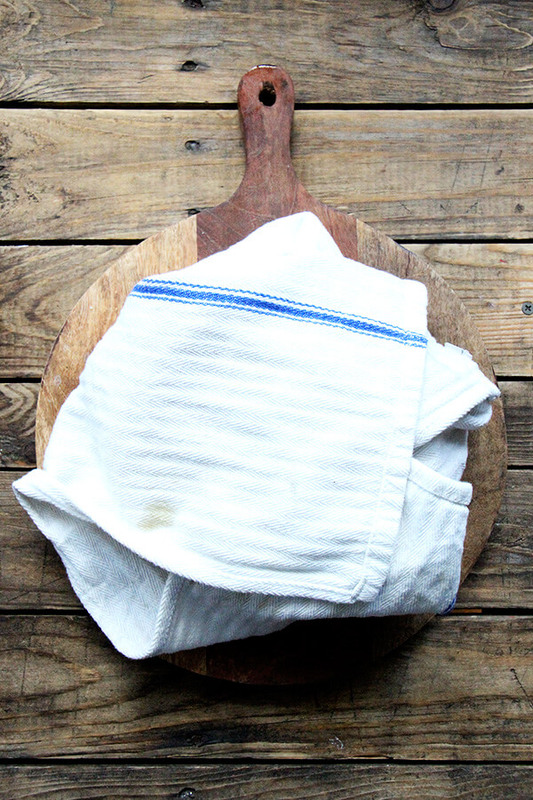 Incidentally, the same friends who gave me Twelve Recipes, taught me the coolest trick: Swaddle just-cooked flatbreads in tea towels, which will cause them to steam and soften, making them pliable, perfect for scooping up dal or cradling chicken souvlaki. More on this shortly. 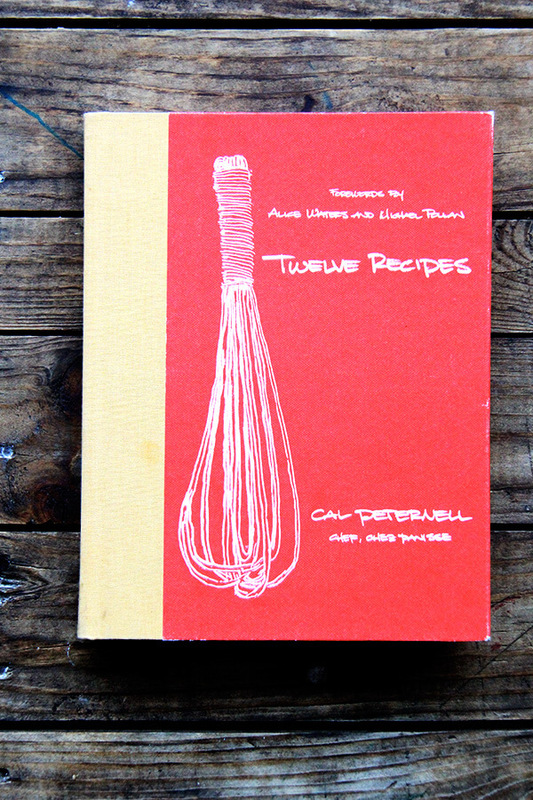 This is becoming one of my favorite cookbooks: Twelve Recipes. See Fried Greens Meatlessballs. Slightly adapted from Cal Peternell’s Twelve Recipes. I know it’s fussy to call for a.) a specific lentil and b.) two different types of lentils, but I love how the green petite French lentils hold their shape while the red lentils (or brown or yellow) dissolve into mush. 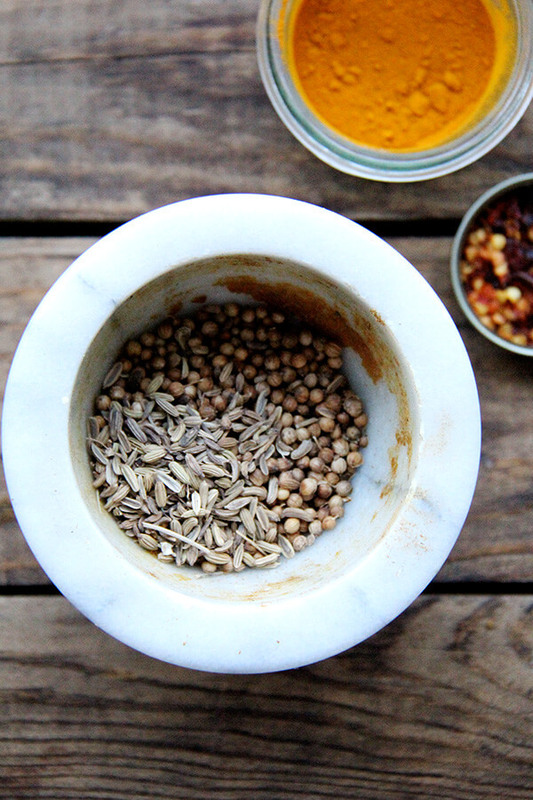 Also, only once have I made this when I actually had all of the proper spices: whole cumin, coriander, and fennel, etc. I’ve used ground cumin. I’ve made it without fennel. 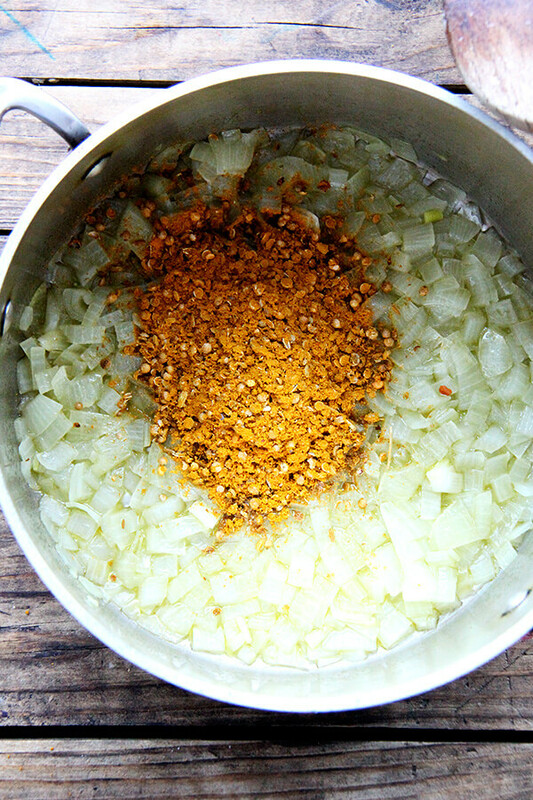 I’ve used curry powder in place of the turmeric, and each time it was delicious. So, feel free to improvise. Finally, in the book, Peternell says that often dal is served with a “sizzle,” which is a mixture of melted butter, garlic, and a pinch more each of the spices used in the dal sizzled together for 30 seconds and spooned over the dal. I’ve yet to make the sizzle, nor have I served this with cilantro or yogurt, all of which sound like delicious additions. Heat a soup pot over high heat. Add the oil and then the onions and salt. Stir, turn the heat to low, and cover the pot. Check and stir after a few minutes, letting the moisture on the lid drip back into the pot to keep things steamy. Lower the heat if there is any browning going on, and re-cover. Cook like this until the onion is tender, about 15 minutes. Add the cumin, coriander, fennel and red pepper flakes and cook, stirring, for 1 minute to toast the spices. Add the turmeric and stir for 30 seconds more. Add the lentils and 4 cups water and bring to a boil. Lower the heat to a simmer and cook, stirring occasionally, until the lentils give up their earthly bodies and become one with your dinner, about 30 minutes. Taste, and adjust seasoning as necessary. I’ve been adding at least another 1/2 teaspoon of salt as well as at least a cup (maybe 2) more of water to the pot as needed while it is simmering. If you are using the French lentils, it may take as long as one hour for the lentils to cook through. Hi Alexandra! Looks delish and I will be trying this soon! Thank you! Yummm! This is next on my “must make” list. 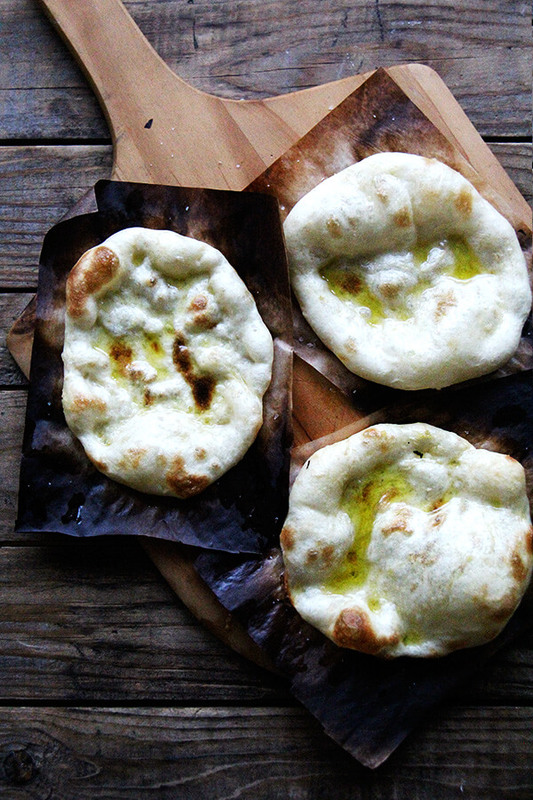 Would you please also post a link to the flatbread recipe in the photos? They look gorgeous! I will post the recipe soon over on the Baking Steel blog and will send you the link. They were super easy and so good! Great-soundind recipe! 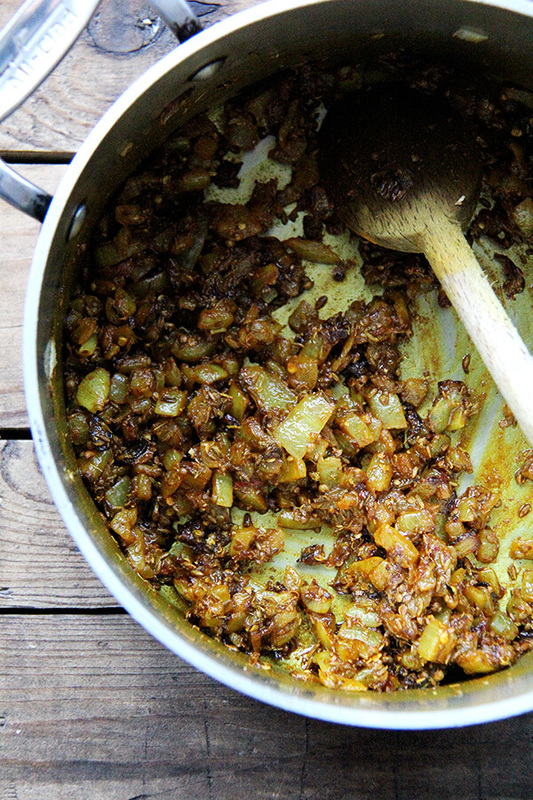 It reminded me of this Mark Bittman piece a while back, where he talks about tadka. I have made a delicious parsnip and potato soup (via Fine Cooking) that also uses this technique of heating mustard seeds, garlic, and other whole spices in oil and drizzling on top. Thanks, as always. LOVED this article! Thank you, Wendy. I am going to request some of Sahni’s books from the library. I think I need to try the tadka/sizzle — sounds fun. And that soup sounds delicious, too. Hope you are well! Oh my, I would love to come home to a dish of this. Made this tonight and had it with rice (three kinds in one pot — who says you can’t combine grains of rice like you can grains of lentils? ), baked salmon, and steamed kale. Really dense flavors and all perfect for a full moon Sunday night in late January. Had it with a Pinot Noir which wasn’t quite right but we’ll figure that out for the next go round. Thank you. Haha, I love it, Martha. I have no guidance re wine, but I can tell you my father would have something to say. He’s always showing up for dinner at my mom’s house, taking a sip of the wine, then shaking his head and saying: “No, no, wrong side of the Rhone!” Can you imagine? Such a riot. Your rice combo sounds perfect. I love your rice! 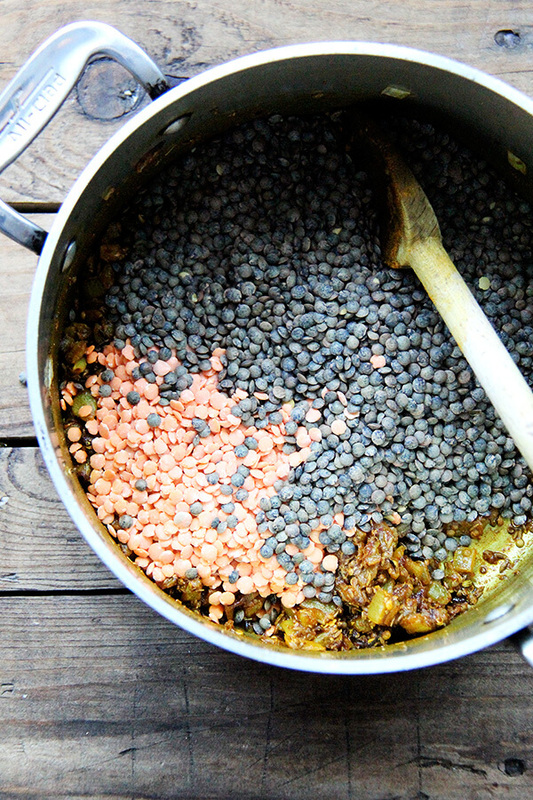 I have some pink lentils sitting in my cabinet currently, and they need to be put to use! This recipe looks perfect for that. thanks for sharing! Perfect! I used several bags of pink (red?) lentils the first time, and it was great. This is like a big warm hug!! I love it! Sharing on social and making later this week for sure! It’s funny, the only recipes I’ve made from his book are the same two you’ve highlighted. Although your texture comments encourage me to try the dal again. It was wonderful the first time, but thinking about the little pop of green lentils makes me hungry for more, and interested in the texture. I make those meatlessballs almost every week with a different variety of greens. They never get old. So funny, Christine! 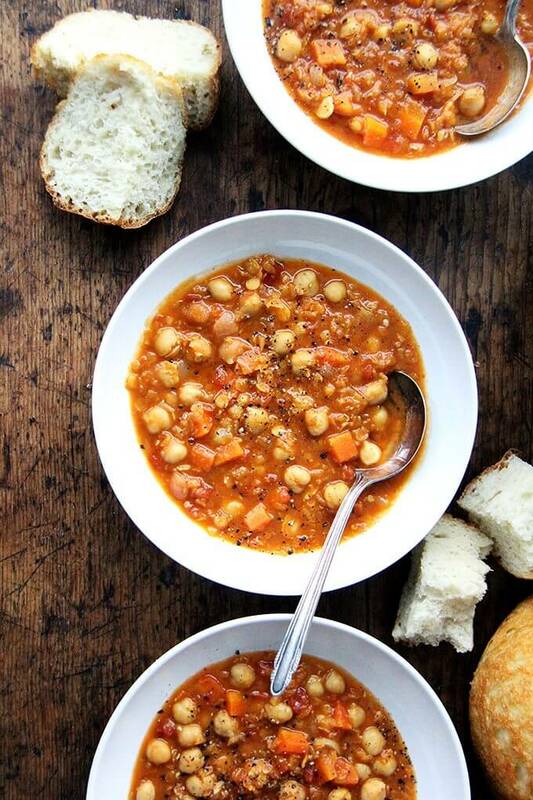 Well, I have one more Twelve Recipes recipe to highlight, tomorrow hopefully: leblebi, a moroccan chickpea stew. It was so good and so easy. I never tire of those meatlessballs either. Thanks for writing in! OK another lovely-appearing dish to try. I’ve been so wanting to increase my dal-pertise: I would like to get to a rhythm where legumes form a larger part of my diet, without having to fuss too much. 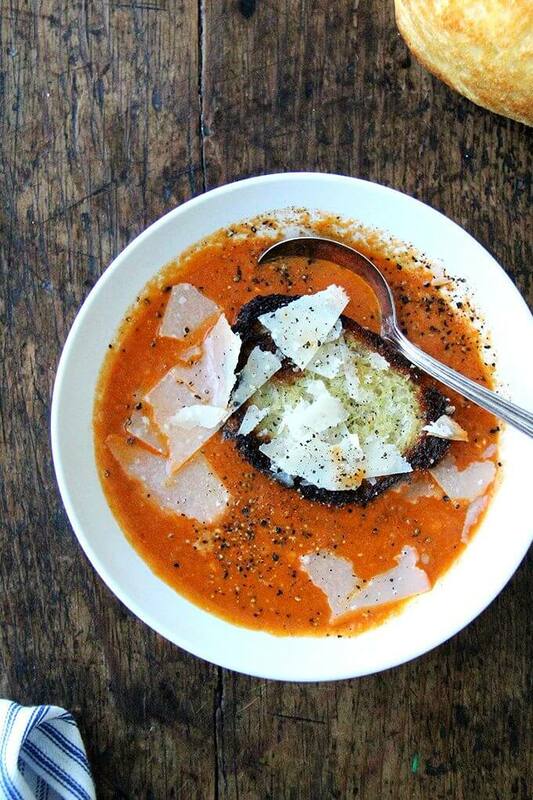 I notice you don’t toast the spices separately – you get that nice toasty end-result still? Me, too! I find once I’m in a legume rhythm, it’s easy to keep up, but I also find once I’m out, soaking the beans feels like such an effort — but it’s not! Peter, thank you for sending this recipe, which looks fantastic! And so funny, because I am about to post another Twelve Recipes recipe: leblebi, a Moroccan chickpea stew, that has so many of these same flavors. 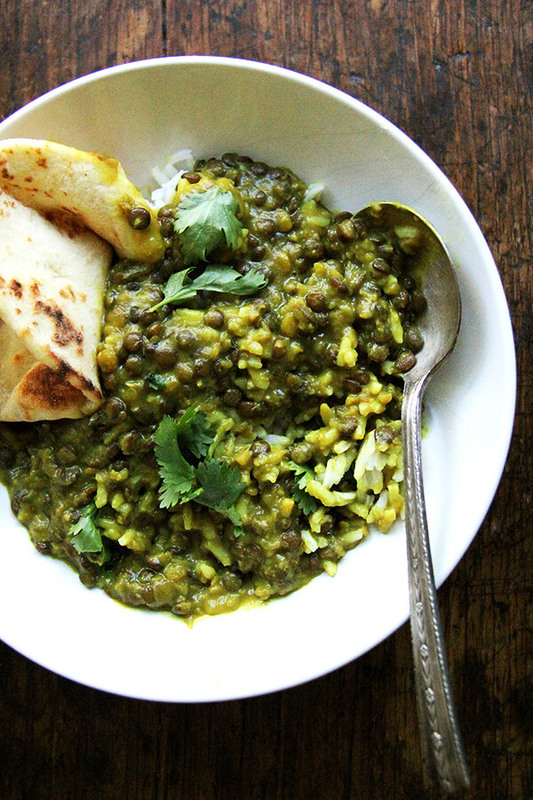 This dal will be next with the sizzle — can’t wait! Oh, and to answer your question —the brief toasting still yielded a very flavorful result though I would be interested in how toasting them briefly in a skillet might make their flavors even more toasty. Will give it a try with that north African dal. 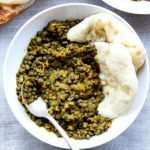 I’ve been making Mark Bittman’s dal and this recipe is much, much better and simplifies the whole process to boot. I used the 2 kinds of lentils, a very nice combination, but by mistake I covered them as they were cooking and discovered that this speeds up the cooking process. So if you cook them covered for about 20 minutes (not counting the onion) and then uncover for about ten, even the French lentils will be cooked in 30 minutes. Uncovered, they do take an hour. I did add the “sizzle” for fun, but the improvement is arguably negligible. I also added a little cilantro and yogurt. One thing about this recipe is that the color is much more pleasing than some other dal recipes, especially those with garam masala, which has a nice flavor, but turns the lentils a muddy brown. Such an economical dish, such wonderful aromas, and so healthy. This will be my new standard lentil recipe. Thank you! Delicious! The combination of lentils absolutely makes it. I found it needed quite a lot more salt – probably 2 1/2 teaspoons in total. Thanks for sharing! I am a salt lover, so I need no convincing of more salt 🙂 So glad you liked this, Alex! Just made a pot of this for lunch. So good! I may never make a dal with only red lentils again. I may never make another dal recipe besides this one. I made this last night: followed the recipe in full except used ground spices for everything except fennel. Still turned out really nice. Needed to use up some baby spinach, so added it in at the end which added some nice color and texture. Topped with a sunny side up egg, cilantro, and a little sriracha. Served with naan (http://cooking.nytimes.com/recipes/1017747-meera-sodhas-naan). 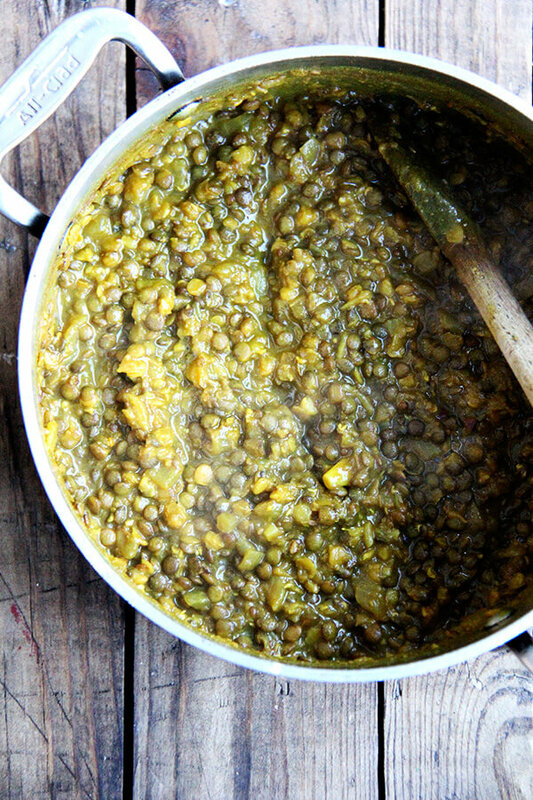 A very luxurious pot of lentils – everyone was very happy.